At Precision Air, we can connect you with one of our Radon Inspection Specialists, who is certified to perform a Continuous Radon Monitor (CRM) test in your home. Precision Air also provides HUD multi-family radon testing and mitigation. HUD's multi-family radon policy requires that all radon testing and mitigation be performed by a certified radon professional. 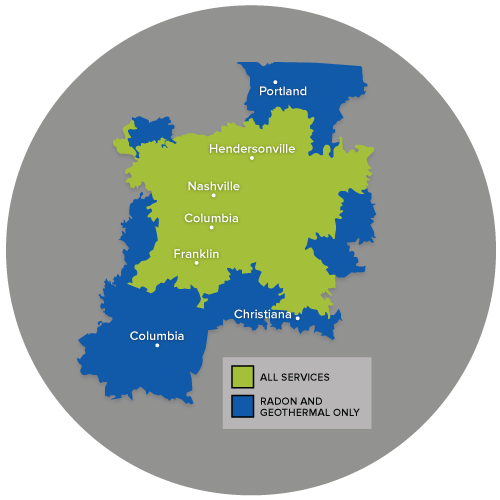 We operate within the Tennessee area, including Franklin, Nashville, Murfreesboro, Hendersonville, Antioch, Smyrna, Brentwood, Madison, Hermitage, Lascassas and the surrounding areas.